The Khun Hynñiewtrep National Awakening Movement (KHNAM)on Thursdayasked the Meghalaya government to interfere and stop the move to convert all casual employees working in Meghalaya Energy Corporation Limited (MeECL) into contractual. In a memorandum submitted to Meghalaya chief secretary Yeshi Tsering, the KHNAM said the MeECL is making a move to convert all casual employees into contractual employees for a period of one year. KHNAM state youth wing president Thomas Passah said that such a move by the MeECL was a clear violation of the notification of the Meghalaya government dated April 18, 1989, which clearly stated that all proposals for appointment on contract service are submitted to the cabinet for its approval after having obtaining the approval of the personnel and finance department. 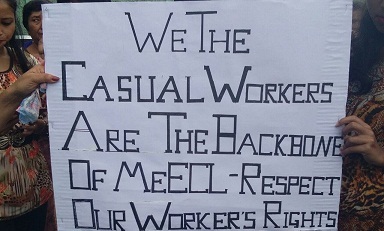 Passah said the MeECL has a large number of employees who had served for many years even up to 20 years. The KHNAM leader also alleged that important verdict of the Supreme Court of India related to implementation of “equal pay for equal work” has not been applied to employees of the Corporation.